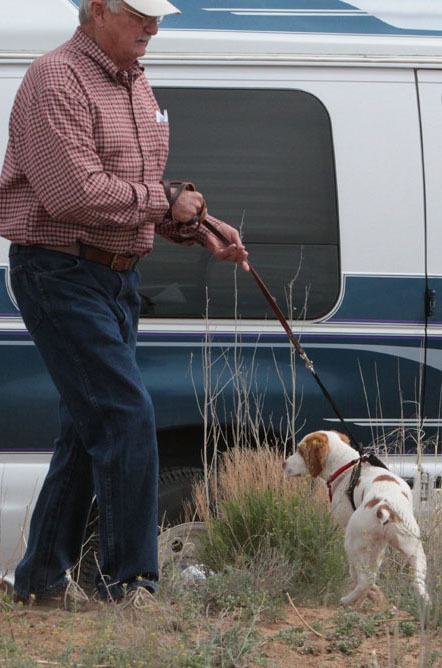 Dog (above), with his handler, walks right up to sniff the rattler in the first part of the clinic. A large percentage of dogs approach rattlesnakes out of curiosity. 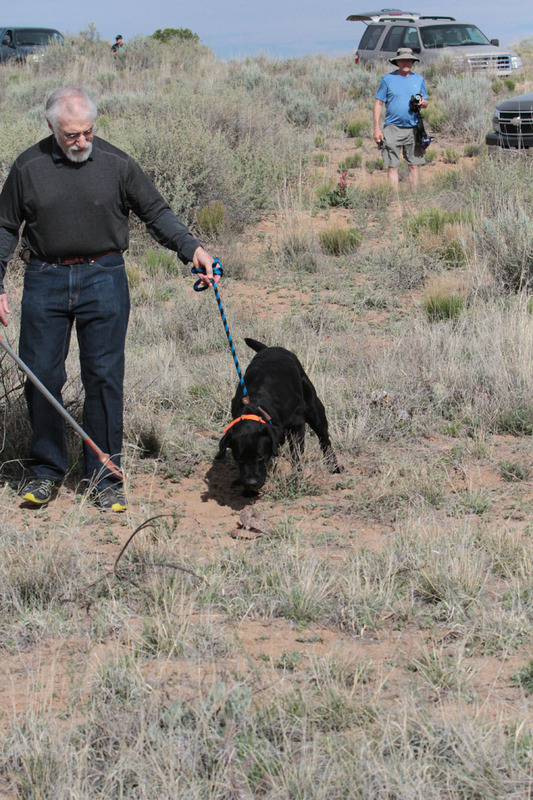 WHAT: Every spring since 2014, the Central New Mexico Brittany Club has hosted Rattlesnake Avoidance Clinics conducted by Terry and Janet Chandler, Rugerheim German Shorthaired Pointers Kennel, Las Cruces, NM. These clinics are open to all dogs. Terry's cllinics are considered the best in the Southwest based on his experience, knowledge and results as attested to by thousands of dog owners. CNMBC brings committed and experienced volunteers to insure you and your dog are prepared while keeping to the schedule. Additionally, photographs of the dogs' behaviors are doucmented and avaialbe to all participants online at no additional cost. No other similar clinic affords this level of assistance and professioanlism. WHEN AND WHERE IS THE TRAINING HELD? CNMBC clinics are held on a spring weekend. This year the Saturday sessions will be held March 9, 2019 on the grounds of the Eldorado Community Center, 1 Hacienda Loop, near Exit 290 off of I-25. The community center will be open with access to bathrooms and drinking fountains. Training sessions are held on the hour beginning at 8:00 a.m. The number of sessions is dependent on the number of registrations. Times may be adjusted based on total registrations. Plan on being onsite for between one and a half to two hours, arriving 15 minutes prior to your hourly start time. Dates for all 2019 clinics are conducted by Terry and Janet Chandler are listed below. NOTE: Only the March 9 and 10 clinics are hosted by CNMBC. WHY: In the Southwest, we live in rattlesnake country. When we take our dogs on walks, hiking, running in fields, hunting, search and rescue, field practice, competing in field events, into our courtyards, patios and even into garages or out buildings, there are chances for encounters with rattlers. In 14 years living outside of Santa Fe, my Brittanys have encountered 20+ snakes, three of them rattlers, on our 2.5 acre property with most encounters occurring inside our courtyard or within 20 ft. of our home. In 2016, local SF veterinarians reported an increase in dogs being bitten by rattlers. Veterinarians in both Santa Fe and Albuquerque have been strong advocates for these CNMBC sponsored clinics. This dog (above), having located the rattlesnake, turns sharply and moves away during the follow-up portion of the clinic. Terry & Janet Chandler have been involved in training, breeding and competing with German Shorthaired Pointers, as well as other high performance sporting breeds, for 40 plus years. Their website is Rugerheim German Shorthaired Pointers Kennel. They have produced and maintained top 10 winning GSP's in the show ring, field trials and in the top 10 producers. They have produced over 250 Bench Champions, 100 Field Champions and 21 Dual Champions. 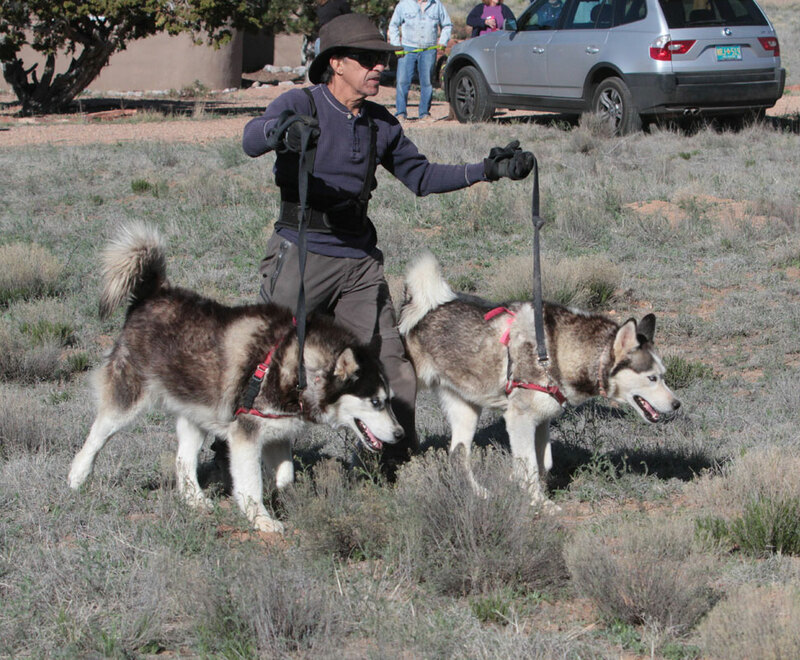 Terry trains only Master Level dogs year round in Las Cruces including conducting a Summer Camp in the White Mountains of AZ. 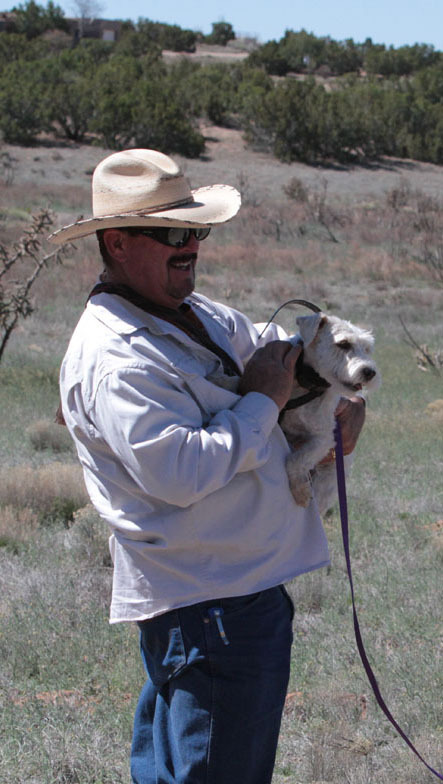 He puts all of his dogs, as well as his clients' dogs, through Rattlesnake Avoidance Clinics. 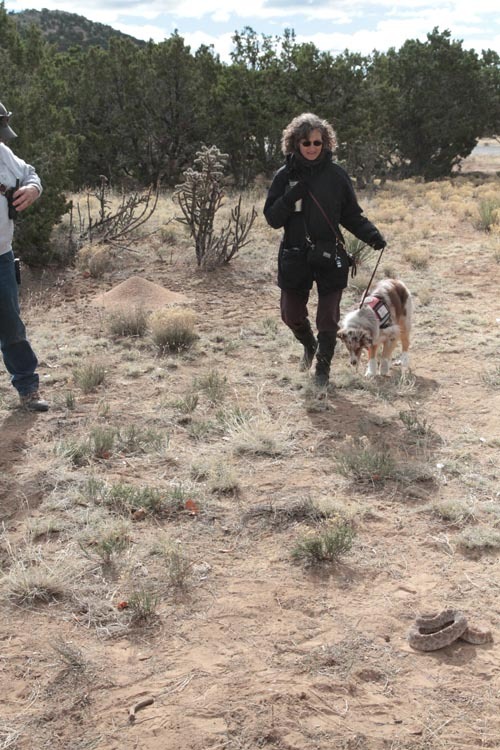 For nearly twenty-five years, since developing this training, Terry and Janet have been conducting rattlesnake avoidance clinics throughout the southwest and beyond, training thousands of dogs with unparalleled success. These clinics are conducted through sponsorship of various dog and sporting clubs such as CNMBC. WHAT ABOUT THE LIVE RATTLESNAKES USED IN THIS CLINIC: The live rattlers used belong to Terry. Prior to the clinic, his snakes are well fed, milked of their venom, and surgically defanged, including the front fangs and, equally important, all the reserve fangs. The rattlers are rendered harmless to dogs and handlers alike.In nature, mature rattlers shed their fangs every six to ten weeks. When one or a pair of fangs is lost, it will soon be replaced by another fully functional fang. HOW THE TRAINING IS CONDUCTED: Groups of up to 25 dogs and handlers are scheduled on the hour. Terry first meets with each group with the dogs put on sit, stand or down stay with their handlers. He reviews his background, how and why he developed this training, and addresses specific questions. The first group in each hourly time block will be "alumni dogs." 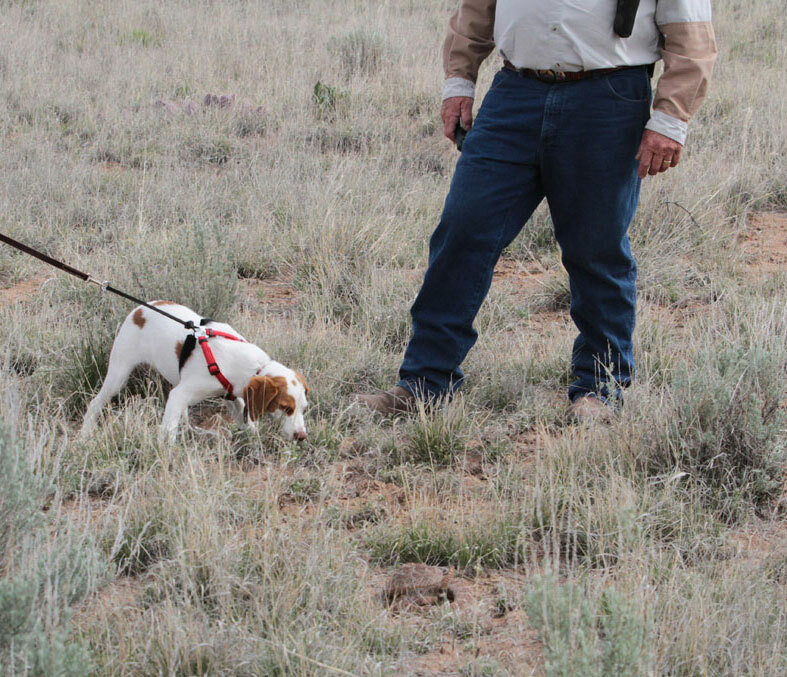 These are dogs returning for their free, one-time review scheduled by their handlers to validate that their learned avoidance behavior when encountering a rattlesnake is intact. These dogs have completed one off Terry's clinics from one or more years ago. This is a chance for first time participating handlers to see how effective this training has been for a wide variety of dogs. The running order will be put together with those handling multiple dogs, going towards the beginning with one of their dogs and towards the end with their other dogs. If a handler has three or more dogs, they will be inserted in a way which gives them time to handle each of the dogs without delaying the group. Historically, groups have worked out the order of participation in the spirit of cooperation. CNMBC volunteers outfit each dog, one-by-one, with an E-collar, including one sized for smaller dogs. As each dog heads out, the "on-deck" dog is outfitted with an E-collar to keep the line moving. This training occurs outside in the natural environment of New Mexico. Dress accordingly, as if you are taking your dog on a hike. Wear appropriate foot wear to insure stability over uneven terrain and to help maintain balance keeping control of your dog if it jumps or lunges. This is a reminder that we encourage having a harness on your dog to minimize stress on your dog's neck but rather distributing it throughout its torso No retractable leashes! 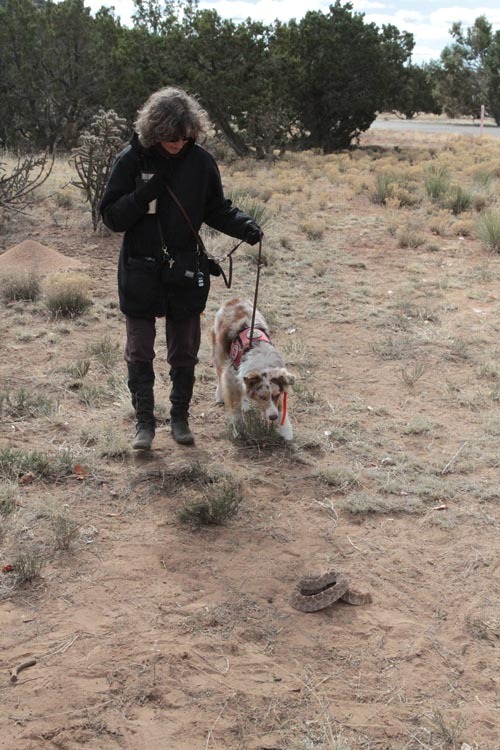 Initially, the handlers walk their dog, on a six-ft lead, towards Terry and is then guided to walk directly towards the rattlesnake into the wind enabling the dog to scent, hear, sight and, ideally, feel the rattlesnake. 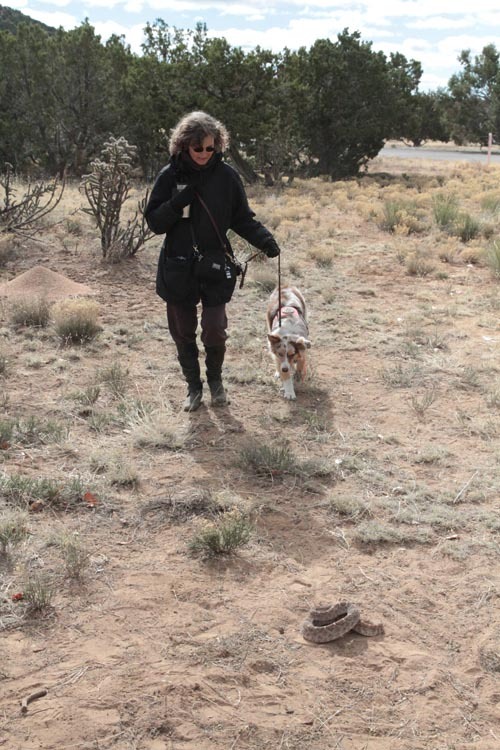 Janet serves as the snake wrangler and assist handlers to walk towards the snake. This aspect of the training has proven to be a bit of a challenge for handlers. There is a tendency for handlers to focus on the snake resulting in sideways movement instead of walking your dog directly towards it. 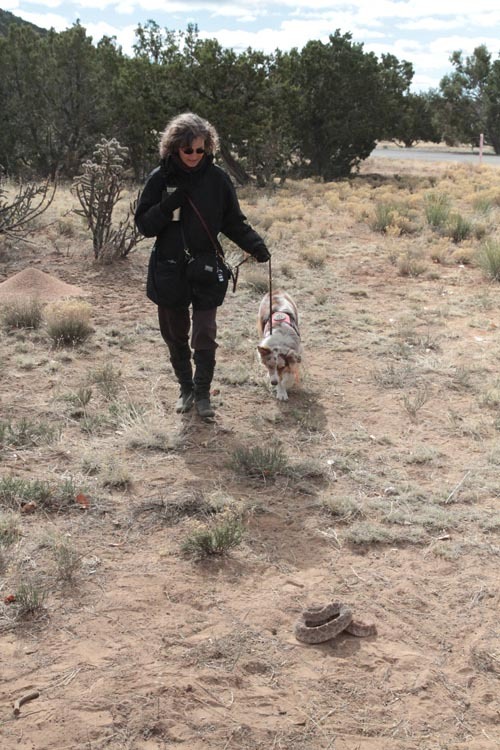 The photos below, left to right, demostrate a good approach by the handler and her dog towards the rattlesnake. Once the dog comes into or near contact with the rattler, Terry administers the E-shock. The goal is for the dog to associate the shock directly to the rattlesnake, creating fear, and thus avoidance of rattlesnakes. This is effective with all rattlers as there is a commonality of scent among the 36 species of rattlesnakes (source: Arizona Game & Fish.) 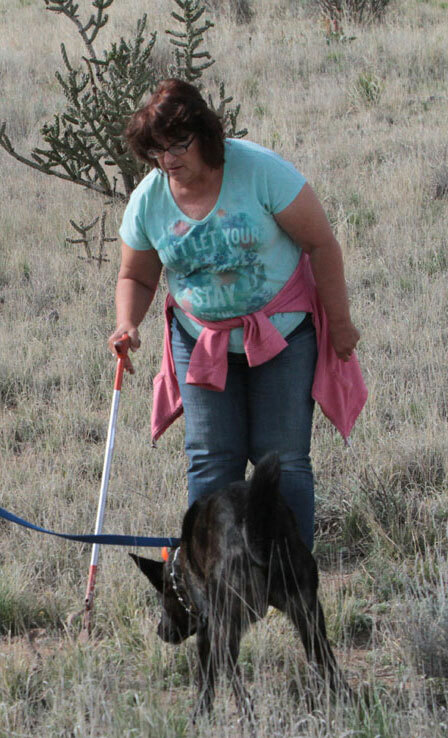 When Terry is satisfied that the association is embedded in the dog's mind, the dog and handler go back to the line, returning the e-collar to a CNMBC volunteer. They then wait for the follow-up testing. When all the dogs in the group have completed this first part of the clinic, the snake is relocated for the second half of training. 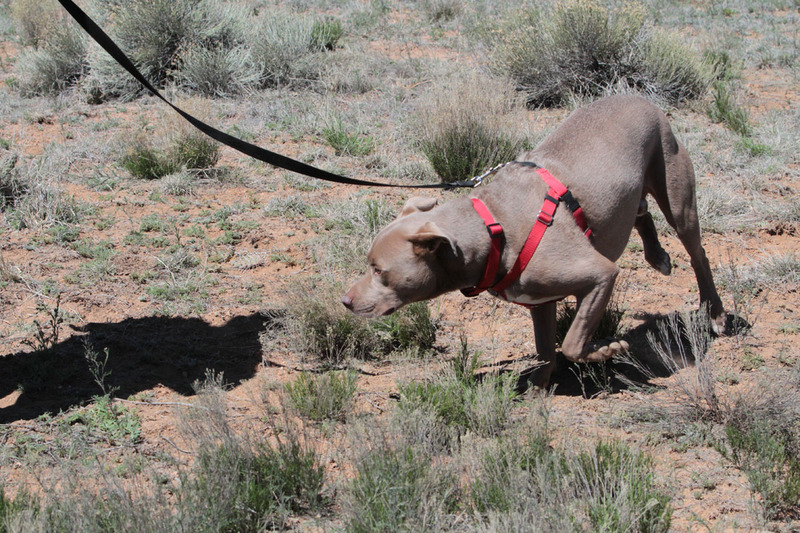 Then, one-by-one, each dog and handler approaches Terry and is directed towards the rattlesnake WITHOUT an e-collar. Again, this is into the wind so the dog's senses of smell, hearing, and sight of the rattlers are stimulated. Terry is looking for how each dog demonstrates avoidance behaviors. This is important information for each handler in understanding their dog's avoidance behavior in the presence of rattlers. HOW OLD SHOULD MY DOG BE TO ATTEND THIS CLINIC? Terry states that if you take your dog into rattlesnake territory, it is old enough to learn to avoid them. In 2016, a four-month old Brittany is pictured above meeting her first rattler (L) and in the follow-up session, retreating after detecting the rattler (R). This young Brittany was to begin her field work soon but first participated in this clinic. Her owner was pleased with the clinic, his dog's reactions, and reported that she showed zero ill affects post clinic participation. WHAT IF I HAVE MULTIPLE DOGS? Parking spaces will be reserved for individuals handling multiple dogs. You will be towards the front of the line to give you time to participate with your first dog and then further back for your other dog(s). We have had individual handlers with three and four dogs and there was no issue getting all dogs completed within the same hour time block. Of course, having someone along to help you is a good idea. IS PHOTOGRAPHY ALLOWED DURING THE CLINIC? A CNMBC volunteer takes photographs of each dog and handler's interactions during this clinic. These photos, with each handler's approval, are posted to the CNMBC website to assist handlers in identifying the dogs' various avoidance behaviors. Participants are welcome to use photos of their dog from the CNMBC website for personal use. We would appreciate being credited for our photographs. NOTE: RAC photos, beginning in 2014, are linked in this table. Handlers may have others with them take photographs or videos as well. The CNMBC volunteer needs to be given space to photograph each dog and handler without obstruction. No photographer should impede the clinicians in conducting the training. ONE TIME FOLLOW-UP ALUMNI TRAINING: Included in the clinic registration fee is a one-time follow-up session in a future clinic conducted by Terry. When the follow-up occurs is up to the owner/handler. Some alumni have returned the following year. Other alumni have returned three, five and more years later. 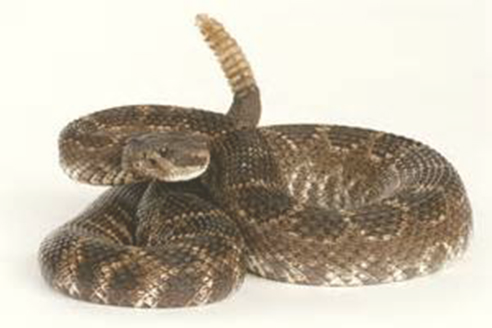 If your dog encounters a rattlesnake and you are satisfied with its behavior, then the follow-up should be delayed. There may well be several RAC Alumni Dogs participating in this year's clinics. They will go first at the beginning of the clinics' time blocks, saving time for all. WILL I BE NOTIFIED WHEN ALUMNI DOG FOLLOW-UP TRAINING OCCURS? No. CNMBC does not maintain an e-mail list of clinic participants. Individual e-mails are used only to confirm and communication about first time training. Dates for future clinics conducted by Terry & Janet Chandler will be posted on this page. This includes clinics sponored by CNMBC as welll as other clinics conducted by the Chandlers. One time free Alumnni Dogs follow-ups are follow-up are welcome at any of these clinics. WILL THIS CLINIC WORK ON ALL SNAKES? Maybe, depending on each dog's reaction. Some dogs may avoid all snakes, some may also avoid garden hoses and others will only react to and avoid rattlesnakes. Terry's goal for all dogs going through this clinic is to avoid rattlesnakes. My Brittany locates, points, and barks at bullsnakes and redracers BUT he avoids rattlers. 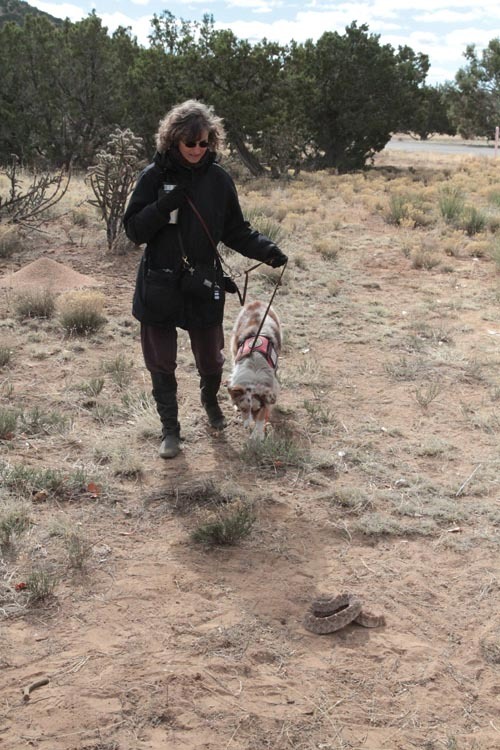 The goal is to keep your dog safe from rattlers' venomous bites. WHAT IF I AM AFRAID OF SNAKES? Owners are encouraged to handle their dog but CNMBC volunteers are there to handle dogs for those who prefer not to get close to the snake. The owner is encouraged to be near enough to observe their dog's reactions to the snake. WHAT SKILLS DOES MY DOG NEED TO ATTEND? Dogs should have good social skills with other dogs and people and be under the control of their handler, including vocalization, particularly during Terry's orientation at the beginning of each clinic's hourly session. Suggest placing your dog on a sit stay or down stay during the orientation. AGRESSIVE DOGS ARE NOT ALLOWED. WHAT DO I NEED TO BRING WITH MY DOG(S)? WHEN DO I NEED TO ARRIVE? Fifteen minutes before your scheduled hourly time block. This will allow time for parking, checking in at the registration table or with CNMBC volunteer, and getting your dog ready, including time to exercise your dog(s). WHAT IS THE COST? Terry provides the Central New Mexico Brittany Club with a discounted price which is passed on to all participants, CNMBC members and non-members alike. This discount price applies to all dogs whether you bring one or multiple dogs. The fee for the 2019 clinics is $65 per dog. PAYMENT is by check, mailed with registration. NOTE: Checks will not be cashed until the clinics are completed. HOW TO REGISTER: Print and complet this registration form and mail it with your check made out to CNMBC. This registration form can be filled in online, then print and mail with your check. Your registration, including schedule time block and directions, will be confirmed via e-mail. Time blocks are filled up as registrations with payment are received. We do our best to honor your first or second choice of time blocks. Demand may require the addition of extra time blocks or the combination of requests into one time block. Walk-up, day of clinic registrations will be accepted pending space availability - call 505-660-6020 for space availability on the day of the clinic. WHAT IF I HAVE MORE QUESTIONS? Contact Tom Mauter on 505-466-6511 or via e-mail at tjmauter@comcast.net before March 8..My cell is 505-660-6020. WHAT IF I NEED TO CONTACT YOU ON THE DAY OF THE TRAINING? Call or text Tom on 505-660-6020. NOTE: Cell service is spotty at the West Mesa location; I photograph all interactions of the participating dogs so I may not be able to take your call. Leave a message or send a text and I will get back.